As American pilots, some female, went overseas to fight, directly or indirectly, in WW2 in Britain and China, many began to see that should the United States enter the war, the demand for pilots would increase dramatically. Independently, female pilots Jackie Cochran and Nancy Harkness Love submitted proposals to the USAAF, arguing that placing female pilots in non-combat roles would free up their male counterparts for combat missions. In 1941, with the support of Colonel Robert Olds and Eleanor Roosevelt, Cochran's proposal broke through to General "Hap" Arnold despite Arnold's initial resistance. Arnold asked Cochran to take a group of qualified female pilots to Britain to learn more from the Air Transport Auxiliary of the Royal Air Force, which had already begun employing female pilots. When WW2 began, it was finally apparent that demands for aviators exceeded the supply. Colonel William H. Tunner of the USAAF Air Transport Command and Love drew up a proposal for female pilots to deliver military aircraft from factory to military air bases; on 5 Sep 1942, Love was named the commander of the Women's Auxiliary Ferrying Squadron, "WAFS", which was based at Newcastle Army Air Base, Delaware, United States. The typical WAFS pilot had 1,400 hours of flight time and had 30 hours of Army training (mostly administrative details). Requirements of the WAFS pilots were American citizenship, between 21 and 35 years of age, minimum of high school education, Commercial Pilot's Certificate, 500 hours of flight time with 50 hours within the past year, 200 horsepower rating, and two letters of recommendation. The average pay for WAFS pilots was about US$250 per month with US$6 per diem while on duty. They began ferrying USAAF aircraft very soon after the start of the program. Arnold, seeing the promise of Tunner's WAFS program and also noting the experience Cochran had acquired in Britain, finally completely set aside his prior prejudice and on 16 Nov 1942 established the 319th Women's Flying Training Detachment, "WFTD", at Municipal Airport, Houston, Texas, United States under Cochran's command. The WFTD had fewer resources than their WAFS counterparts, which meant that they had no uniforms, no life insurance, no crash truck, and no fire truck. Morale became an issue that was never truly resolved with WFTD, especially after the 7 Mar 1943 incident where pilot trainee Margaret Oldenburg and instructor Norris G. Morgan were killed in a crash south of Houston. In Jul 1943, to streamline command and to better distribute resources, the two programs merged together to form the Women Airforce Service Pilots, "WASP"; the disbanding of WAFS and WFTD programs took place officially on 5 Aug 1943. Although administered by the US Army, WASP was designated a civil service branch. The repercussion of this would be felt by the families of the 38 WASP aviators who lost their lives while performing their duties during WW2, who were deprived of military honors and even the public funding to transport their remains home for burial. On 21 Jun 1944, the United States House of Representatives attempted to improve the situation by granting WASP military status, but the bill was narrowly defeated. On 1 Jul 1944, uniforms were finally ordered for WASP pilots from the Philadelphia Quartermaster Depot. The uniform consisted of a blue blouse with three buttons, a matching skirt, and a white shirt with black necktie. Many of the women also wore A-2 or B-3 leather flight jackets over their uniforms when performing ferrying missions. WASP training was centralized at Sweetwater, Texas, United States, and trained pilots were deployed to 120 various air bases within the United States. By the end of the WASP program in Dec 1944, over 1,000 pilots were trained (including the predecessor programs WAFS and WFTD), who flew more than 60,000,000 miles of operational flights, which included the ferrying of aircraft from aircraft factories to ports and air bases, towing targets for live anti-aircraft artillery practice, simulated strafing missions, and transporting cargo. Speaking specifically of the ferrying missions, pilots of WASP delivered 12,650 aircraft during the war, which made up of over 50% of combat aircraft built in the United States during that time period. On 20 Dec 1944, Arnold disbanded WASP. Originally prejudiced against the potentials of female pilots, by now the female pilots had won him over. In fact, one of the reasons for him to disband WASP was due to the unsuccessful attempt of the Congress to make WASP personnel members of the military. On 7 Dec 1944, during a speech he delivered at Sweetwater, he said that the "WASP have completed their mission. Their job has been successful.... The Air Forces will long remember their service and their final sacrifice." In 1975, Colonel Bruce Arnold, son of General "Hap" Arnold, began lobbying for WASP pilots to be recognized as veterans. They were eventually successful. In 1977, with support of Senator and former ferry pilot Barry Goldwater, President Jimmy Carter signed the G. I. 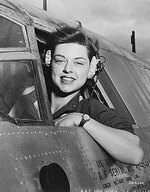 Bill Improvement Act which granted WASP pilots full military status. Sources: The US Home Front, Wikipedia. when was the article last modified? i need the information for a project. thank you. This information is great! This was my favorite website for learning about the WASPs! Thank you! I am portraying a WASP as a reenactor and need information on what they wore. From my research and emailing actual women who were WASP they tell me they did not wear a hat, tie until the last five months of the WASP when the uniform was issued. I was told by one WASP that she wore Officer's pink trouser and matching shirt. I've seen photos of Khaki pants that they bought at the local PX and matching shirt. I do have an A2 Flight Jacket and wish to be correct in my portrayal - no rank was worn either as I understand - In my research I have read much about what they did - but I need to know how they were dressed - any comments welcomed. Thank you. There was no rank worn, of course, since there was no rank. These women were civilian "volunteers" - at the time, part of the Civil Service - and had no military status whatsoever until decades later. Though flying was (and is) an inherently dangerous game, the WASPS had no insurance and no right even to a military funeral for those 38 women who died in the cockpit. The WASP A2 jacket normally carried a USAAF patch on the left sleeve, and Fifinella on the front left of the jacket. When a WASP refers to "pink" trousers, she's talking about the shade of khaki worn during WWII. Almost a beige, it had a slight pink sheen to it. The same shade was worn by men as it was the standard khaki back then. If you asked the earliest WASPs what they were issued, however, I'm sure you'll hear horror stories of surplus mechanics' overalls in size 44 and up! That must have been quite the sight - a petite 5'2" woman trying to look dignified in work overalls twice here size! Did any of the WASP pilots ferry Air Force planes to England during WW2 ? Yes they did near Preston, Lancs.They also wore allsorts of different combinations of dress while they were doing this,they really wore what they wanted or could get their hands on. Thanks Rick. this site is okay very informative where do you find the organization title? HELP these people are my history prject and i need to know almost everything about these peeps!! Let us remember these heroic ladies and all non-coms of WW2. They should be recognized at veterans, just as all non coms should be. The combat veterans relied heavily on non coms such as transport pilots, ambulance drivers, their instructors and even General of the Army Marshall himself. There has been so virtually no recognition, an honor these courageous women so richly have earned and deserve. At the time they were treated as "second class citizens" or "also-rans", no rank, no benefits, and very little respect. Recent times have changed that, none too soon as there are few of these WASPS still living. PLease message me the article and the local and foreign .. i need to my project .. Thank you . I have just pick up A2 42" for the WASPS would any one like to buy it? 30 years or so ago, I saw a movie about the WASPS and I can't remember it nor can I find info on it. anyone have any info on this? this was an ok site but they did not fight overseas and well honestly im a little confused by all of this. 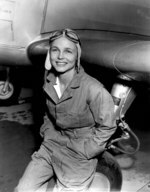 I am trying to locate information on a WWII female pilot who my father knew by the name Meg Connor for a book he is writing. She transported higher ranking officers and other VIPs to various meetings around the country, as well as routine gunnery target flights. 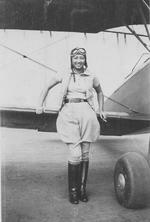 She was stationed in Hondo Texas circa 1943-45, and flew an A-20 converted to passenger duty. Apparently she was quite a character and well known. Pointers to any information about her, or the transport unit at Hondo (which, at the time, was hush-hush because of the people they were carrying), would be appreciated. My email address is losborne@chaminade.edu. I was surprised to see how many died in "training" and "routine" flights. Totally ignorant about realities of piloting. Is that just to be expected? This is in response to comment #29: Thirty-eight women died as members of the WASPs. They actually had a slightly better percentage than their male counterparts. Piloting airplanes is a dangerous pursuit, but these women were highly capable and navigated with just a compass, watch and map. Truly sad that it took until 1977, well over thirty years too long, to grant these honored veterans full military status. God know they earned it, and then some. As a retired Air Force member I salute your service, dedication and sacrifice. We may have been able to win the war without their contribution but the cost in both time and lives would have been so much greater. I know a little too late, but God Bless them and their service. Bullpoop! Jackie Cochran got tired of trying to help our "boys" and tired of meeting this resistance, she organized twenty-five American women to fly for Great Britain. It was HER decision! As an aside to the ATA and the WASP units the Russian Red Air Force, decades ahead of the Brits and Yanks, had women combat pilots. There were a number of aces and one very famous ace who was called the "White Lily", a somewhat tragic story. When German pilots recognized her plane they tried to edge away and not get in a dogfight with her. At Stalingrad there was a unit of women fighter pilots the Germans called the "Night Witches". They flew these older bi-planes, not because they weren't trusted but because at night (the only light being burning buildings) they'd approach the city then kill their motor to glide the rest of the way in to drop their bombs. They were a psychological attack on the Germans. The Germans would hear the plane aways off then silence..the Germans had a hard time sleeping not knowing where the Night Witches bombs would fall next, would they be next to get the chop? So this wore the Germans out even more than they already were. This was a lot of help for my school report. It’s a shame that these ladies did such a good service for our country that they had to fight for the right to be called veterans.